We spent all of yesterday setting up and rehearsing for the big day today! The Commons Hall at AKAM is a large, beautifully designed, extremely high-ceilinged building which is used as a dining hall and venue for special events. It has massive floor-to-ceiling window walls on opposite sides of the hall, with open metal grills on the exterior. Together with several large skylights, a large, imposing room is bathed in bright light. A masterpiece of natural lighting and a nightmare for slideshow presentations, such as our graduation. After the staff used their slingshots to empty the room of large crows (scaring them out – not shooting them), we brought in a special crew with gigantic ladders to hang black curtains over every window, from top to bottom. This took all night. By morning, we had managed to block out most of the external light and set up all of our equipment for the big event. A stage was erected in a recessed section of the hall and the students’ favorite prints were displayed on panels along one of the large walls. All of the dining tables were removed, and chairs were set up to accommodate the 200 guests. While the invitation to the Graduation indicated that it would start at 10 AM, as usual, several important guests arrived half an hour late, and we finally started at 10:30. Our guest of honor, Dr. Najya Muhammed spoke next. She tied the mission and goals of the workshop into the environment and being socially aware as young photographers. Last came a surprise Behind The Scenes slideshow and the presentation of the Graduation Certificates, group pictures and a copy of each student’s display print. It was heartwarming to see the students’ photos up on a big screen in front of their family and friends. There was a lot of excitement and we were fortunate to have many members of the community attend. 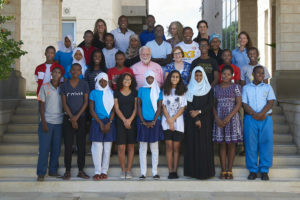 Thank you to the Aga Khan Academy Mombasa for hosting us. Without your facilities and supportive staff we would have not been able to have such a successful workshop. Special thanks to Alex Holland, The Curriculum Development Manager at the Aga Khan Academies. She’s the woman who makes miracles happen. And to all of our students, thank you for attending, for your tireless effort, for your open, creative spirit, and for another successful, transformational workshop. Congratulations to the students and your team for another outstanding workshop ! You are truly an Ambassador of GoodWill traveling the world and leaving your love of photography with the next generation ! Brilliant! Fred and his team do wonders for the world!